If you or someone you love has diabetes, you are not alone — more than twenty million Americans now live with the disease. 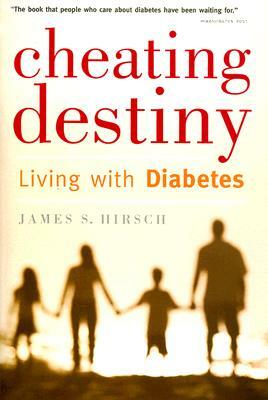 In Cheating Destiny, the best-selling author James S. Hirsch offers an incisive, sometimes surprising portrait of diabetes in America. Hirsch is intimately familiar with the disease: he has lived with type 1 diabetes for three decades. His brother, Irl, also a diabetic, is one of the country’s leading diabetologists. Most poignantly, his son Garrett was diagnosed at age three. Hirsch draws on his unique expertise to provide an engaging blend of reportage, memoir, history, and advocacy. He offers revealing views of life with diabetes: the urge toward secrecy that many diabetics feel, the everyday psychological and emotional hurdles, and the perseverance — even heroism — required for survival. Hirsch takes a look at the science behind the disease and its treatment, and lays bare the impact on our economy, society, and our families. Anyone who lives with diabetes — or loves a diabetic — will find this book essential reading. James S. Hirsch, a former reporter for the New York Times and the Wall Street Journal, is the author of Cheating Destiny, the bestseller Hurricane: The Miracle Journey of Rubin Carter, Riot and Remembrance: The Tulsa Race War and Its Legacy, and Two Souls Indivisible: The Friendship That Saved Two POWs in Vietnam. He is also a principal of Close Concerns, a consultancy and publishing company that specializes in diabetes. He lives in the Boston area with his wife, Sheryl, and their children, Amanda and Garrett.